Happy Thanksgiving! 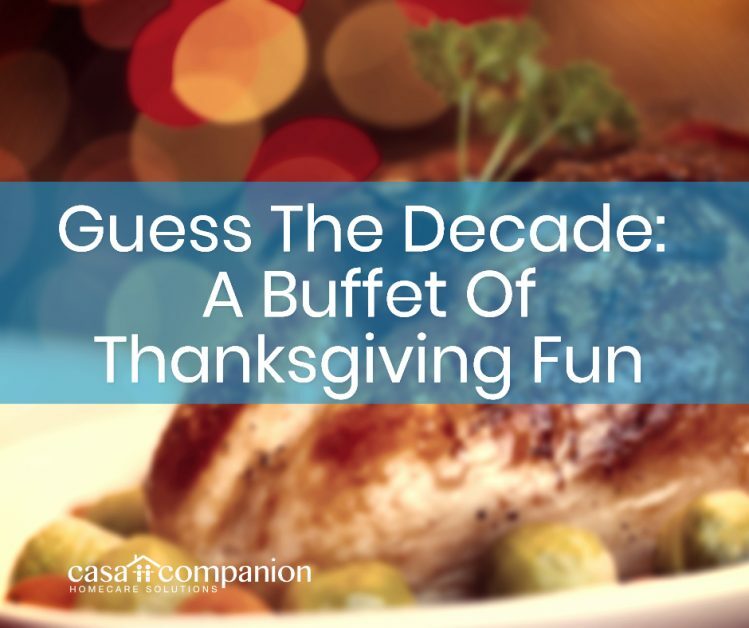 Did you know that Thanksgiving feasts have changed quite a bit since the first Thanksgiving? Our tastes have changed, and the foods we consider special have changed too. Plus, we have access to a much wider array of foods than the Pilgrims did – thanks, supermarkets and the trucking industry! Americans have made some bizarre choices about what to eat at a holiday about gratitude through the years. Don’t we all have that aunt or grandma whose annual contribution is the cherished dish from her youth that everyone else finds weird and a little icky? While waiting for seconds this year, caregivers, home care aides and loved ones will all enjoy reviewing the menus of Thanksgivings Past! Let’s play a Thanksgiving game: look at these real menus from different decades in American culinary history and try to guess the decade they graced our holiday tables! “Hot Tomato Starter, Roast Turkey, Herb Stuffing, Cranberry Sauce, Orange-glazed Sweet Potatoes, Buttered Green Beans, Apple-Pineapple Slaw, Hot Biscuits, Butter, Pumpkin Pie, Hot Coffee.” Other side dishes popular in this decade included Jell-O with shrimp frosting, and Cranberry Holiday Surprise (featuring Jell-O and mayonnaise). May your Thanksgiving be a day of happiness for you and yours!